Thanks to those who showed their courage and commitment today at the Meet in the Middle march to/in Fresno, CA. And to all who were there virtually. Might Cleve Jones be tiptoeing into a leadership role in the fight for queer rights? 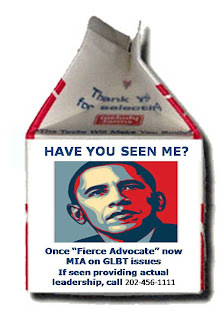 Wielding Harvey Milk’s bullhorn, it’s hard to think otherwise…. Sometimes I wish that folks could see how ridiculous their objections are. Objections to gay marriage, because, you know, my marriage will make theirs less sacred. Portia DiRossi recently made a “PSA” about the “ill effects” of gay marriage on folks who are against it. It’s hilarious. Completely hilarious. Have a look. And let’s hope that some of those pro-prop 8 folks will see and hear how ridiculous their arguments are. Hey, I can hope, right?